In the deal of the day 08/10, Amazon is offering Duxtop LCD 1800-Watt Portable Induction Cooktop Countertop Burner for ONLY $74.99 Shipped (Reg $150). 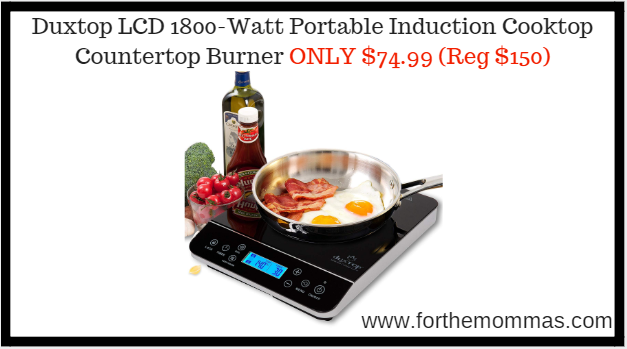 Compatible with Duxtop Whole-Clad premium cookware and other induction ready cookware such as cast aluminum enameled iron and steel, stainless steel with a magnetic bottom, or cast iron. The auto-pan detection will shut the unit off automatically after 60 seconds if no cookware, or the incorrect cookware is detected; Equipped with diagnostic error message system, Low and high voltage warning system; ETL approved and built to North American Standards. 1-year Manufacturer’s warranty.